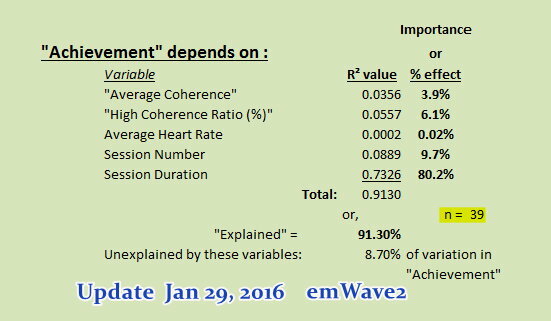 In a previous Article, we had been studying "Achievement" as it presents in using the emWave2 device from the Institute of HeartMath. 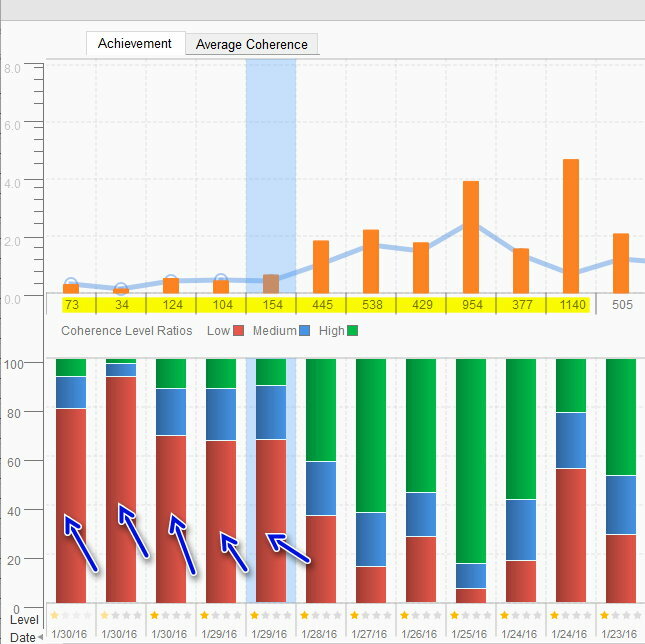 "Does the "Achievement" value depend on : "Average Coherence," "High Coherence Ratio % (green level)," Average Heart Rate, Session Number (=length of training), Session Duration (in minutes)? But the next day, the relationships between these variables began to destabilize ... What was going on? Often, when something like this happens, one should think about the possibility that a new variable has been introduced. Something which changes relationships of the previously studied variables. Hmm... Now what would that be? Well, how about this guy ? "Does the "Achievement" value depend on : "Average Coherence," "High Coherence Ratio % (green level)," Average Heart Rate, Session Number (=length of training), Session Duration (in minutes), in subjects with and without influenza? " Was that the study that we intended to do at the outset? No, not at all. Q: But does having the flu even make a difference in these variables that concern "Achievement"? "How would you know?" Ans: There are marked differences in these data arising from Heart Rate Variability measurements, when the flu is present. 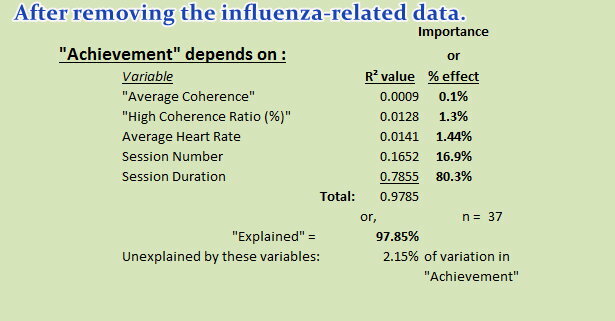 At the bottom, the p value for these means, tells us that the difference with and without the flu is quite significant: Less than 1 chance in 10,000 that an apparent difference in these variables arose by chance. The only variable where "p" is not significant (p=0.49) is for the mean duration of each session, just under 30 minutes, and as planned. Differences in Heart Rate (Avg.HR) and "Achievement" are also significant. So having the flu makes a huge difference in the outcomes from emWave2 measurements. Hoping that these differences will eventually just get diluted as more data get added is an error. Including the data equates with doing a different study than the one intended. Let's exclude all the flu-effected data. DO NOT THROW IT AWAY! It's trying to tell us something, perhaps important. Notice that "Coherence" plays a very minor role in "Achievement" when compared with other determining variables. So what is the link, or, is there a link, between influenza, the heart, heart rate variability, the autonomic nervous system, and HeartMath Tools and Techniques such as "Quick Coherence?" 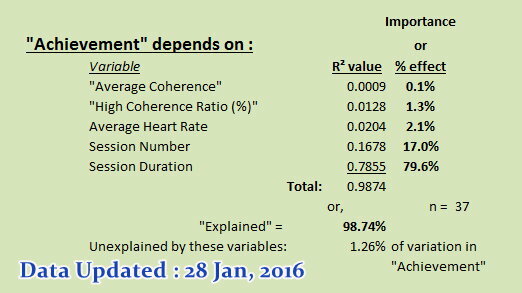 Several times during these "high red" results, "Quick Coherence" was performed to try and increase "Avg. Coherence." It made no difference at all. We'll look more closely at why that was so in a subsequent article. Recall that we did not discard the "flu data" but only set it aside. 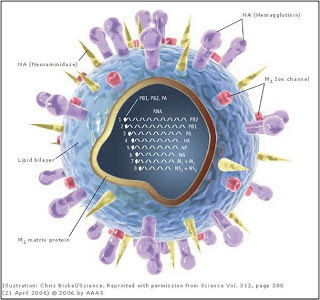 It will serve us well to better understand how influenza impacts heart rate variability. This, in fact, through a full blown and insidious attack on the heart: An attack that has been greatly overlooked in the literature on influenza.